Hi, my name is Mara Lauren. I was diagnosed with a rare eye condition called Retinitis Pigmentosa (RP) in 2010. Recently, I was diagnosed with Usher Syndrome, which not only includes vision loss but also hearing loss. When I was first diagnosed with RP it was a big life-changing experience. I was told I was going blind and there was nothing I could do to prevent this. The initial diagnosis by a Doctor who had little education on the subject was very callous. His uncaring approach made me feel hopeless and lost, which caused me to go into depression for a 2-year period. That depression stage of my life was tough as if I didn’t want to live anymore. The feeling of being alone, not knowing what will happen and what the future would bring really hit me hard. I disconnected from the world and the feeling of not wanting to live anymore was always on my mind. Eventually, I with the right people. The right specialists who helped to give me hope and let me know this eye condition shouldn’t stop me from living the life I want and it wasn’t the end. In 2014, I started to really look at my life and I knew I had to change my mindset. That this depression was the jolt I actually needed to start focusing on what really matters and to completely revamp my life by staying positive. It was at this point with the help of my caring husband by my side, I have done just that. I started getting involved with The Canadian National Institute for the Blind (CNIB) as a support group leader, I am part of The Foundation Fighting Blindness(American and Canadian organizations), also I have recently joined Trailblazers Tandem Cycling Club (a registered charity, who provides recreational cycling to people who have limited or no vision). In the summer of 2016 I conquered Cycling For Sight, a fundraising event with The Foundation Fighting Blindness to find a cure for degenerative blindness. This was one of my biggest accomplishments thus far because it has been one of my goals since being diagnosed, it wasn’t easy but I was able to complete the 91km event. Now that 2017 is here, I have signed up to do the full race of 180km Cycle for Sight that will be held in June 2017 and signed up for different activities that I want to try. So you have to wait for it and see what I’m up to! I will also try to blog more this new year and you can find me on atemara.com or simply my Instagram, atemara. Outside of social media, I pretty much keep myself busy with all the organizations I’m involved in and I try to live a fit active lifestyle by working out and eating healthy, but of course occasionally I must indulge. Another big aspect of my life is traveling, spending time with loved ones and just enjoying life to its fullest. 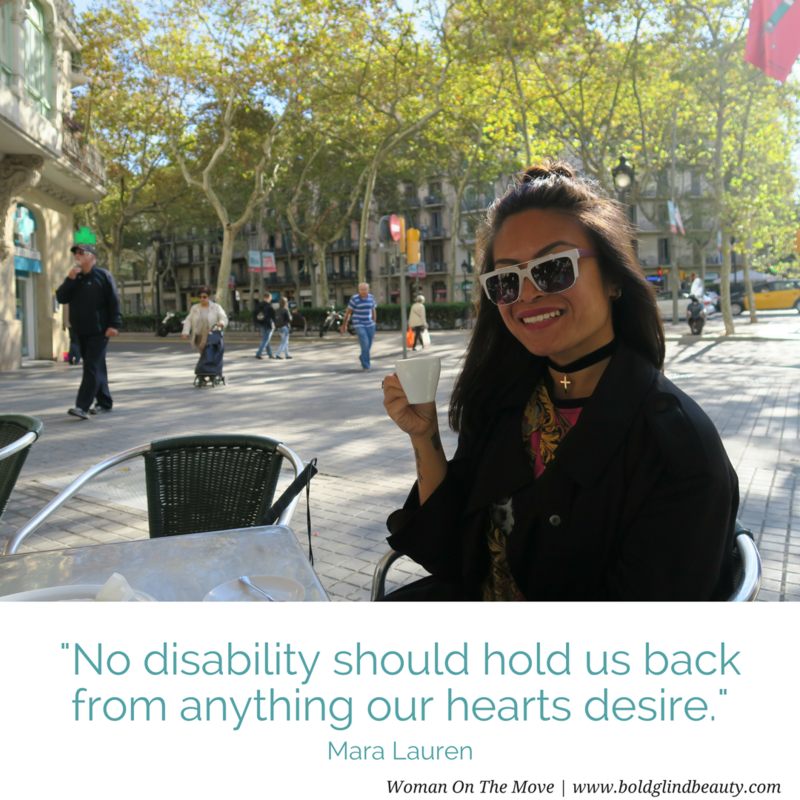 I always say, no disability should hold us back from anything our hearts desire. We can still do it all. Photo of Woman On The Move Mara in boldblindbeauty.com’s WOTM template. She is looking very stylish wearing fashionable shades while sitting outdoors holding a coffee cup in her right hand. Three-quarters of the template contains the photo and in the bottom portion is Mara’s quote in teal text. This is so inspiring! Thank you for sharing! Beautiful! You’re very welcome Peta! Thank you for reading I’m glad you enjoyed Mara’s story. This is a truly inspiring story! She’s such an amazing lady Kathy. Thanks for reading her story. This is a grave and empowering testimony coming from Mara… I truly enjoyed this post, dear Steph!!! 😀 Have a beautiful 2017 ahead! Thank you! Mara is an awesome person. wow! just show how powerful the right connections can be to turning your life around. thanks for sharing – great post. Thanks Brigid!! Mara is one of my heroes. She is so good at looking at the positive side of life. Thanks for this new introduction, Steph. She sounds delightful. Oh she’s a fabulous woman Oneta! I’m so fortunate to have crossed paths with her. She is so motivating. Great, inspirational stuff! I hope the full Cycle for Sight activity in 2017 will be as successful as the 91km event in 2016. I was sorry to hear about the doctor’s attitude to begin with, though. I don’t blame doctors for not being an expert on every subject (that’s specialists are for), but there’s no excuse for being callous and uncaring. Thanks Bun! I agree with you on doctor’s attitudes and really for any professional for that matter. We all have our bad days but to make someone else feel bad doesn’t help either party. It’s awful the number of similar stories of doctors who are insensitive to their patient’s plight, especially when it involves a life altering diagnosis. Makes me wonder why they even bothered getting into the profession but perhaps life changed for them and they are unable to separate their bitterness from the job. I love it when you share others’ stories here – they really are inspirational! Thanks Sarah!💙 I love sharing their stories because these ladies are so phenomenal. There’s such a huge network of fellow advocates all working to make the world a better place and I’m thrilled to be part of it. Thank you Bruce!! I will let her know she’s beginning to get some comments here. She is a force to be reckoned with and has a huge following on Instagram. Her strength and motivating words are so moving.